Equipment: No Special Equipment Needed! Get ready to have some fun with one of the best beach workouts ever, led by the super fun trainers at Studio SWEAT onDemand. Do these awesome bodyweight exercises at the beach, park, home, or on the road! Mere W & Tatiana will take you through a quick dynamic warm up, followed by two 12 minute rounds of intervals designed to hit all major muscle groups. Yep, it’s a total body beach workout in less than 30 minutes. Let’s go have some fun and get this done! MM2019-Nice change of pace doing this class. Two fun trainers for sure!! Very nice workout! I only got the 50/50…..workout…no sun tan. Guess I need to move to SD. Have a great Navy day! HW2019 #4 1 of 2 for double day. Killer class. Thanks Mere W & Tatiana…great fun! HW2019! This is an awesome body weight class. My wrists struggled at the end though. HW2019 #3 double day. Wish I was at the beach!! HW2019 #2. Double day done. Good body weight sculpt to start my morning! BSP…This workout never disappoints. Thank you both. Mmc2018-Great change of pace! Nice mix ladies!! MMC2018 – #17. Thank you for the great sculpt. Mmc2018-Nice change when I wanted something different! MMC 2018 #8 – “beach” was in front of my house in the dark, early morning December cold. Added some weights fir good measure! Fun workout! Drive to 25 #22. Great full body workout and will make you envious of Mere W and Tatiana’s location! Drive to 25 #23 Thanks ladies! Drive for 25. #15 did it in Maui! Great way to incorporate the beach into sculpting! Drive to 25 22/25: fun! Drive 25 #10. Great way to end the day! Drive to 25 #4 … strangely enjoyable despite being knackering!! Awesome job girls. Got to workout on the beach without getting sand in my shoes! #SFL2018 no.3 – and it’s my double day! Enjoyed this workout on my beach vacation at Hilton Head, SC. Will do it again later in the week! Thanks for such awesome workouts! SFL2018-wow, now I wish that I was on the beach! Loved the 12 minute intervals and of course the energy and enthusiasm of Mere W and Tatiana! Awesome body weight workout you can take anywhere!! Love enjoying the beach vicariously through y’all! A great workout on the beach or any space! It does not take a lot of room so it would be a great one to do in a hotel room while traveling. I loved being on the beach to do it but be prepared to get sandy! I did this workout on a tile floor with a mat and it made all the push-up sets really difficult because the mat kept sliding, it was very aggravating! However, I still feel like I got a great workout in! I can’t wait to try it again outside when I go on vacation in a few weeks. BSP #1 This one was hard on my wrists with all those pushups and planks. Still was a sweaty mess at the finish! So much sweaty fun! The beach looks gorgeous! Done at home today. Can’t wait to do it at the beach in a week! So fun. Thanks Mere W and Tatiana! Holy Moly!!!! All that leg work, I don’t think the stairs will be my friend tomorrow!! Perfect timing since I leave for the beach Saturday!!! Fun fun fun. Love that I can do this anywhere! No excuses. Time to tackle some of the best Back Exercises and battle bra fat with this Chest Toning Workout. And, you’re going to love the results because this killer Back and Chest workout can seriously change the look of your upper body. How? Well, sculpting the back and chest make the biggest impact on your body’s north side because they’re the biggest muscle groups in your upper body! The format is simple with two 9 minute strength circuits and a short halftime “break”. Just push play now to Carve it Up! 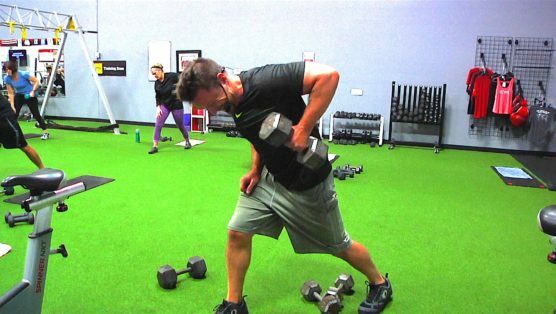 Get ready for a fast, functional 30 minute strength routine that works every muscle group, even your brain. You’ll be moving in different planes of motion to gain mobility and lean body mass. Every move can be modified to make it harder or easier too, so it is perfect for newbies and experts alike. All you need is one heavy dumbbell, a set of medium dumbbells, a mat (optional), and a can-do attitude! Let’s start sweating and shredding! Get ready to fire it up fast with this killer 20 minute HIIT workout! And if you’re in a really big hurry, but you want to break a quick sweat, you can make it a 10 minute HIIT workout. 10 Full-Body, High-Intensity Exercises for 45 seconds each, with 15 seconds breathers between them, is what you’re gonna do. That’s right, you ARE gonna do that! And the cool part is that you’ll even have fun. I swear! You can’t help to with this one, to be honest. So do some body warm-ups (like jumping jacks), make sure you have something you can do a tricep dip on, and let’s get this thing done! PS- If you have TRX straps, grab them to spice this bad boy up.